The floods and landslides that hit Kerala in August 2018 had caused unimaginable loss of life and property. Responding to these catastrophic floods, ActionAid Association India’s humanitarian response team, with support from volunteers and several allies, had reached out to the worst-affected communities with immediate relief. With long-term recovery in mind, we also assessed the rehabilitation needs of the most vulnerable families. 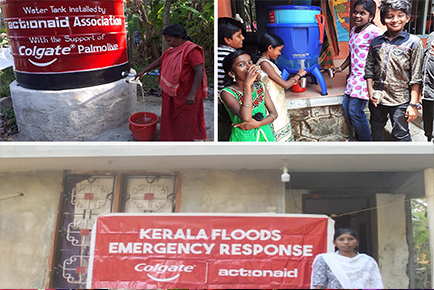 With support from Colgate-Palmolive, we initiated rehabilitation efforts in Pandanadu Panchayat of Chengannur block in Alappuzha district. The major activities proposed under this intervention included installation of water tanks for storing water, setting up of water purifiers to ensure communities’ access to safe drinking water and repair of houses of the most vulnerable families. We are happy to inform you that in February, we successfully completed the rehabilitation interventions in Pandanadu. Four water tanks (with a capacity of 2000 litres each) and 10 water purifiers (with a capacity of 25 litres each) were set up in the panchayat, providing access to safe drinking water to more than 100 families. “Following the floods in 2018, there was water scarcity in Pandanadu Panchayat; we were not even able to get safe drinking water. We are happy with the installation of these new water tanks in the panchayat. We are thankful to ActionAid India and Colgate-Palmolive for this,” said Mini Jaison, a women’s leader from Pandanadu Panchayat. Besides, house repair support was provided to 32 most vulnerable families in the panchayat. As part of this intervention, houses of single women and families from socially and economically marginalized communities were repaired; the repairs included roof sheet replacement, wall plastering, floor repairing and door frame fixing.